A geological disaster occurs when natural geological processes impact on our activities, either through loss of life or injury, or through economic loss. A geological hazard is a potential disaster. The Province of Newfoundland and Labrador is fortunate in that such impacts are comparatively minor compared to many other parts of the world. This is mainly due to its situation in a relatively inactive seismic area, and because of low population densities. Geological disasters and hazards, however, still inflict a major economic and social cost to the province. Such disasters are to differing degrees avoidable or preventable if the hazards are identified. 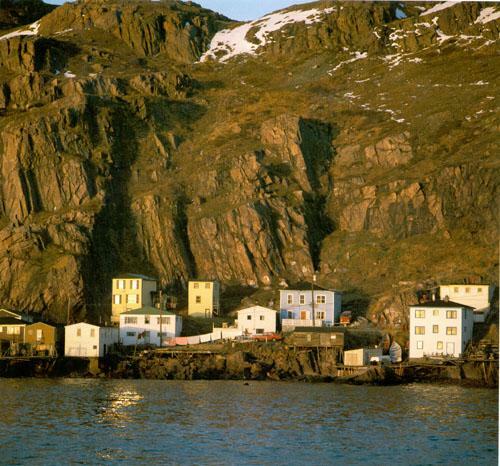 Situated below the steep slopes of Signal Hill in St. John's, the Battery, a small fishing community, has been the site of several fatal avalanches and rockfalls. Reproduced by permission of Ben Hansen. From Ben Hansen, Newfoundland (St. John's: Vinland Press, © 1987). Pages unnumbered. In partial response to this concern, the Geological Survey, Government of Newfoundland and Labrador, initiated a project to examine the record of past geological disasters in the province. The findings to date (1999) are reported here, arranged by major hazard type and illustrated with selected examples. They document the nature and extent of geological disasters in the Province, and show the estimated costs, both social and economic, associated with such events. For other Landscape related articles view the Natural Environment Table of Contents.